Q Acoustics turns on the style with Q7000 speaker package | What Hi-Fi? We have a confession to make: Q Acoustics may only have officially unveiled its new Q7000 style speaker package today, but we've had a complete system in our test rooms for a couple of weeks. In fact, you can read our full verdict on the set-up in our October 2011 issue, on sale from today. We're not (yet) going to publish the full review here on whathifi.com, but in the meantime here's the background information on the latest addition to the Q Acoustics range. You can always pop out and buy the mag if you want to know more! Q Acoustics' brand manager Tony Jones doesn't mince his words: "The new 7000 series is small, looks beautiful in either gloss black or white finishes, and delivers an audio quality previously thought unattainable for style speakers in the sub-£1000 price sector." Fighting talk. So what's so clever about the Q7000 series? Well, while at first sight it may look like a classic 'five satellites and subwoofer' combo, the Q7000's three front and two rear speakers are in fact full-range models, albeit with the limited bass extension you would expect to find with any bookshelf design, claims Jones. The infinite baffle enclosures are cast in aluminium and damping materials are applied internally to reduce any resonance. Each speaker has twin custom designed, 7.5cm ultra-long-throw mid/bass drivers, coupled with a 25mm 'Ring Radiator' tweeter. 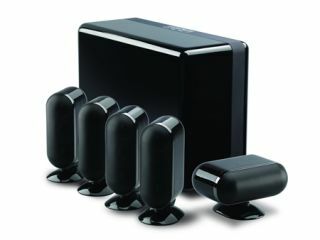 An integral stand on each speaker can be adjusted for wall or ceiling mounting, and includes cable management. A pair of floorstands costs £125 extra. Perhaps the cleverest part of the design is the slim subwoofer design which incorporates a 25cm bass driver that fires against a rigid 'sounding board'. This surface deflects the bass notes evenly into the room through slim subwoofer grilles located on the top and both sides of the gloss-finished unit. The sub is floor or wall mountable (a wall bracket costs extra) and has a built-in 250W analogue amplifier. The Q Acoustics Q7000 speaker package will be available in September for £800.